The Buddeez Bread Buddy is a nifty little plastic bread storage container. This bread keeper is designed to keep your bread loaf fresher for longer. If you're wondering how to store bread or the best way to store bread, this bread storage container is a top plastic bread keeper box on the market. Bread buddies can't be beat if you're in need of an airtight bread box. 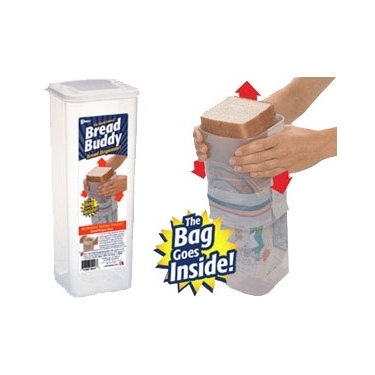 Like many of the Buddeez products, this bread buddy uses a bag-in approach for added freshness and storage. Do you have members of your household that like white bread while others prefer wheat? Keep a few bread keeper storage containers on hand and make everybody happy. Use a bread keeper and airtight bread box to avoid wasting money you throw away when your bread gets moldy. With the money you save, you may find this plastic bread storage container as your new bread buddy. The lid on the airtight bread box snaps down over the overlay of the bread bag. As you need more bread, you can slide the overlay of the bag down the length of the airtight bread container, keeping excess air out of the bread buddy storage container. Your bread stays fresher longer in this bread keeper. You'll especially love that this plastic bread container is BPA free. Watch the helpful video for more insight into the workings of the bread buddy.